There's little doubt the La Quinta Dunes Course is merely a Corvette parked in the carport shadow of its younger Lamborghini sibling -- the La Quinta Mountain course. But Tim Walton, La Quinta's General Manager and PGA Professional, points out an interesting fact. "The Dunes Course is considered a softer, more manageable Pete Dye design that is very fair from the forward tees," Walton said. "But the PGA Tour Qualifying School has been here six times and not one player has really ripped it up. "From the back tees it's only 6,747 yards, par 72, but there's some kind of forced carry on every hole. You have a target course, but the average player can get away with some mis-hits from the upper tees. The professional playing from the back will be penalized for any mistakes he makes." No. 17, ranked by PGA of America as one of the 18 toughest in the USA, is one of those holes the pros could err on. The 433-yard par-4 bends left around a lake and has a treacherous two-tiered green. The water hazard is only one of seven in the 18-hole layout. "Under the pressure of a tournament it's one of those holes that can get you," Walton continued. "The water is left and its lined by a large bunker before you make the fairway. The green is surrounded by pot and grass bunkers." The 18th can also pose problems. This time the water is right. It's only 390 yards, but there's a narrow fairway to hit on your drive. The approach could be over a sliver of water to a right pin placement. You will see lots of Dye's trademark railroad ties on this water hole. "The Dunes Course can't really give the Mountain Course much competition," said Ray Smith of Abilene, KS. "The 17th and 18th holes are interesting and challenging and the par-3 13th is a fun water hole. I also liked the par-3 6th (191 yards). But there's an area that goes down into the drainage ditches and it seemed out of place in such an upscale resort. The conditioning was good though and it sure beats the golf I could play this time of the year in Kansas. 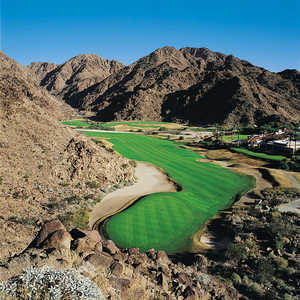 You really can't go wrong playing any La Quinta or PGA West course." Built in 1981, the Dunes Course, a 37-35, par-72, was the first of La Quinta's landmark three Dye designs. Besides the Dunes target-style test with small greens, there's the Mountain Course, awesome in beauty and strategic in play, and the other has been called "cruel" -- the PGA West TPC Stadium Course. The Dunes and Mountain layouts are bumped against the Santa Rosa Mountains, only a minute from the seven decades old La Quinta Resort, a former getaway for Hollywood's "Golden Era" movie stars. The beauty of the area is matched by its history. Native Americans populated the area that is now La Quinta more than 2,000 years ago. The golf course land was once covered by Lake Cahuilla, which eventually dried up in the 1600s. But if you look closely, scientists say, you can still see the shoreline, visible on the mountains adjacent to La Quinta. In the 19th century the natives grew cotton and sugar cane and raised cattle. The La Quinta Resort was opened in December 1926. La Quinta is a young city incorporated in 1982. It's in the heart of the Coachella Valley and known for its golf, thriving arts community and as a fast-growing city. Green Fees: $145, includes cart and range. Priority is given to hotel guests at the La Quinta Resort & Club, who may book 120 days in advance. Tee times are accepted three days prior to play for outside play. Directions: From I-10 take Washington south. Go past Highway 111. Turn right on Eisenhower Drive and proceed south. Go past the entrance to La Quinta Resort one block and turn right on Calle Mazaltlan and proceed through the security gate. Turn left at Avenida Vista Bonita. The golf courses are a short drive on the left.